The International Centre for Ethnic Studies (ICES) is promoting, on September 10, lectures on Freedom of Religion in Divided Societies of Asia: Law, Politics and Rights. The US Ford Foundation (hereafter, FordF) funds the ICES. God may have created the world, but Ford, Rockefeller and Morgan reinvented the world in the 1920s – and it was good…business. 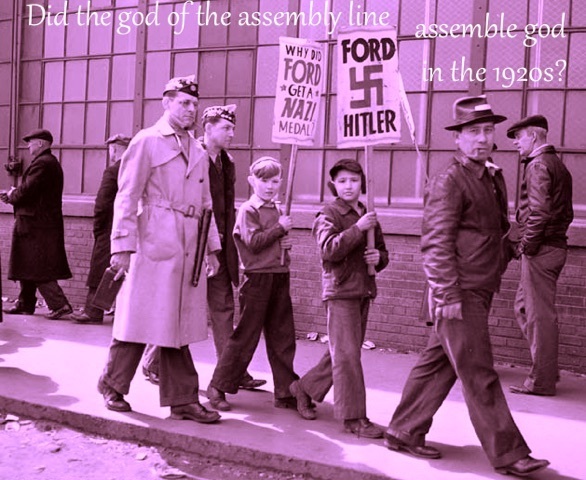 Henry Ford, great industrial god of the assembly line, was a Hitler fan (who called white settlers his older brothers!). Ford famously trashed history as “Bunk”, so how come his Foundation waxes so earnest about ethnicity and religion? You may see this as irrelevant as asking why Ford’s Detroit still has no clean water? Or, why India with no democratic toilets is building them in Pottuvil? FordF may claim they are no longer linked to the Fords, but only to their earthly private legacy, and of course to the US government, which speaks brashly and carries a big stick on behalf of such foundations who do good but end up doing us in, and well! Thank you! It was the Ford Foundation after all that set off the madness of the 20th century arms race, when FordF founder (of Douglas Aircraft’s RAND Corp too) Rowan Gaither falsely declared a ‘missile gap’ between the USSR and the USA in 1957, yoking philanthropies, corporations and universities to blow up the world. FordF and its poorer multibillionaire-in-crime the Rockefeller Foundation, like hee and haw, like axle and petrol, constitute among the largest ‘foundations’ in the world, operating as ‘charities’, i.e. as corporate laundries and tax shelters. These INGOs of all INGOs – grandf-ers of all INGOs – like one-time funder of white eugenics, the Rockefeller Foundation, (which through its subsidiary Caltex that squeezes our National Transport Policy by the you-know-what, also telling us not to drink and drive, but only imbibe more imported petrol) – siphons cash to its baby foundations, like the Clinton Foundation. And the Clinton Foundation funnels funds to, well, sweet sounding storefronts like the state-inaugurated Office for National Unity and Reconciliation (ONUR) in Sri Lanka. The ONUR, in turn, funds ‘artists’, some of whom have long lost the plot on the national screen, despite the crying need to metanarrate our political and economic priorities. Seeking to prolong careers, they make not good film, but by being controversial about matters of rather abstracted and egoistic sexualities and beliefs, court ‘censorship’ so as to obtain further funds. The goal of INGOs is not artistic, religious nor national unity. Their role on behalf of the multinational corporations, is to prevent true economic independence via an industrial renaissance that requires a strong home market and national sovereignty. INGOs wish to lever up power to larger undemocratic multilateral regional institutions stripping it away from nation states. They and numerous business groups and think tanks (like the hijacked IPS, Advocata, etc) oppose centralized government, and what they consider useless subsidies to favored elites. They equate a debtless national government with nirvana. Their theme of ‘illegitimate sovereign national governments’ protecting local elites is imbricated (to use a skyscraping mason-baas gadol-ism) in the various Free Trade Agreements, and part of the philosophy underlying the World Trade Organization. So surprise, surprise! A Canadian trade expert too will lecture on religion. High Commissioner David McKinnon is: ‘Promoting freedom of religion in deeply divided societies’. An MBA, a Department of External Affairs trade commissioner, McKinnon was by 2017 director general of its ‘Physical Resources Bureau’ (Mines? ), also responsible for delivering ‘Canada’s trade and investment program in India and Nepal’. So how on earth (or in heaven) did trader McKinnon gather virtuosity on religious freedom? God is clearly not just dead, s/he is being actively arbitraged on the bond market. And as for “deeply divided society”, McKinnon being a white settler from Canada is surely a pundit on this. The Canadian government, operates as a gleaming cathedral for global mining multinationals, whose altar is the Toronto Stock Exchange – their real expertise being the dividing of original people into smaller and smaller tribes, bands and reservations, extracting their remaining lands and resources. Canada’s courts have declared racism legal, even as they bruit racism as morally wrong! Legal because Canadian law is based on English law, for whom slavery remains key no matter all gab about abolition. The word ‘ethnic’ is promoted – to update discredited theories of race – an ‘othering’ word. Rare is its usage to describe non-anglo whites or the Queen of England. Darker peoples are called “Visible Minorities” in Canada, implying they’d prefer them unseeable. The so-called ethnic leaders of their ‘multicultural society, like many of our ambassadors, remain pimps – involved in the recruitment, trafficking and placement of underwaged workers. ICES is also funded by the Canadian, German, Swedish and Norwegian governments. The German government’s idea of religious reconciliation was to pay compensation for their holocaust of Jews by donating nuclear submarines to the state of Israel to annihilate its darker neighbours! The Swedish and Norwegian states, long defeated in attempting chattel slavery and colonial escapades, are now back in the game. Sweden’s Nobel-Bofors sold missiles to both sides in the Iraq-Iran (Sunni-Shia?) war at the same time. Rather than develop their own people and home market, these imperialist states wish to continue our underdevelopment by stealing resources, selling us overpriced goods, outsourcing (inexpensive to them) labor-intensive low-level manufacturing to our countries, and importing some darkies as migrants or refugees, to undermine their own workers, or to use them as front shop-window mannequins for how glowing and inclusive their societies are. Meanwhile, Center for Policy Alternatives (CPA) executive director and philosophical doctor Paikiasothy Saravanamuttu will sermonize on ‘freedom of religion and the politics of reform.’ Dr. S, emperor arrayed in raiments of GO (but not NGO) transparency, still cannot explain his massive liquor billings, let alone reform of the CPA to enable us find out. So let us lift up a glass to the heavens, declaring pol arrack the religion of the masses with whisky in transparently opaque chalices reserved for the pontiffs and archbishops of INGOs. Then Radhika Coomaraswamy – now an expert on Buddhists and Muslims, not in Jafnna, but in Mynamar – will lecture on ‘The challenges to freedom of religion in South and South-east Asia.” While her judge father once laid down the merchants’ terms and conditions for white-collar clerical workers but disallowed security of service – an award which nonetheless had to be ‘seen’ as treating workers well, because of the national upsurge in 1956 – she has not seen fit in this climate of hyper-capitalism to fight for overall worker security in this country. All talk of democracy and rights still stops outside the door to the factory and office, and the ICES parking lot. See how these ‘good governance’ prophets are demonizing unions these days. Rather than historicize overall colonial depredation and our urgent need for reparatory reconstruction, she chooses to maintain the special status that colonialism bestowed on 19th Century comprador fractions by now riding shotgun for multinational corporations to extend their continuing agendas. To deconstruct religion and ‘civil’ (a loaded term that echoes white supremacist claims to civil-ization), we recommend a good hard read of Marx’s On the Jewish Question. Marx has been accused of anti-semitism here, for he says; “What is the secular cult of the Jew? Huckstering?’ What is his secular god? Money?” What he concludes is we first need emancipation from huckstering and money, not from religion. He pointed out the leading Christian (and we could here add our own local merchant/religious) groups are money sects, as or more Jewish than the stereotyped Jews! Yet secular capitalist banks have long surpassed usurer and moneylender, and our merchants of money and imports remain fronts for larger international banks and of course purveyors of religion, headquartered elsewhere. Why do all these religious actors perpetuate capitalist underdevelopment of our country, and wish to be ‘civil.’ Does ICES offer an economic plan to re/build our society’s productive forces? A merchant dominated society; our merchants do not make anything. They sell. They are rentiers, not entrepreneurs. They don’t increase the size of the roti. They take larger slices of existing roti. They steal from each other. It’s a dog-eat-dog and god-eat-god world!